Throughout the early 20th century, Nashville's cultural, musical, and social scene was segregated. Southern culture, at that time, was separated into black and white neighborhoods, keeping the richness of our music, art, and even our food from coming together. 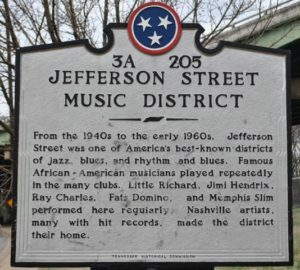 Discover the history of this important area, taste its food, and hear some of its incredible stories of struggle, joy, and the indelible imprint that Jefferson Street has had on Nashville's amazing culture. You'll taste iconic southern foods, hear their stories, and gain a new appreciation for how foods, art, and history develop to create amazing things from less than amazing circumstances. Join us on this 3-hour adventure through historic universities, unique foods, as we experience the amazing Jefferson Street. Available as a private tour any date, or join our public tour beginning in April, Tuesdays at 10:30.